Dirt and honing debris are every hydraulic systems' worst enemies. Tuxco's CBW-300 Cylinder Washer guarantees that cylinders will be contaminant free when they are reassembled and reinstalled into the field. Dirt and honing debris are every hydraulic systems’ worst enemies. Tuxco’s CBW-300 Cylinder Washer guarantees that cylinders will be contaminant free when they are reassembled and reinstalled into the field. 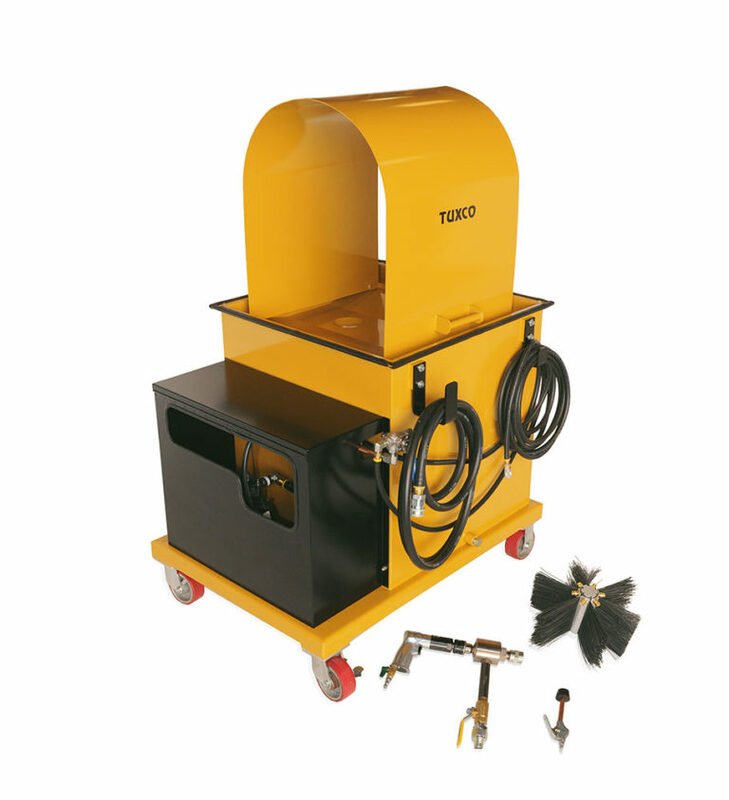 The CBW-300 uses rotating pressure spray nozzles and rotating brushes to make repaired cylinders factory clean. A powerful 12 GPM diaphragm pump that flushes out all the debris quickly. Two sets of brushes handle cylinders with from 4 to 13 1/2″ bores. Cleaning solution, dirt and debris don’t go down the drain. The effluent exits the cylinder under a splash guard to keep the work area clean and dry. It then passes through 25 micron filter bags that cleans the solution, returning it to the Washer tank for reuse. A second filter stack will filter the solution down to 3 microns. Debris is trapped by the filter bags and disposed of with the shop’s dry waste. It’s a system designed for maximum productivity and to help avoid OSHA and EPA violations. The unit operates 100% off of compressed shop air.